By now, most people are aware of what they get when they call a sales or support team. They know the vocal tone they’ll be greeted with. They know the impersonal service that will work quickly to get them off the line. They’re used to staying on hold and being transferred, over and over again. Simply put, we’re very used to speaking to sales and support staff that simply don’t care. They’re working a job, and they’re getting paid to do something they don’t like. And it shows. The problem is, your sales and support teams are the lifeblood of your business. They’re responsible for bringing in new business and keeping that business. If you have a happy and motivated sales team, you’ll bring in more business. If you have a happy and motivated support team, you’ll retain that business and develop a glowing reputation in your market. The good news is, because so few businesses show they truly care over the phone, if you do, you’ll stand out big time. Now, I’m not here to tell you how to run your business. I’m simply saying that you should use call recording to be the judge. Try different approaches to picking up the phone and speaking to prospects or customers. Replay the conversations with call recording and identify which ones made sales, and which didn’t. Look for rises and drops in the conversations, to determine why a call may have resulted in a sale, or didn’t result in a sale. The true key to a sales and support team that increases sales and long-term customer loyalty is a culture of caring to understand. Caring enough to be curious as to who you’re talking to. Figuring out how the caller communicates and matching their style. Making them comfortable and addressing their questions or problems. Determining what mood they’re in and understanding how to work with them. Treating every caller as an opportunity to increase business if handled correctly. So why don’t most sales and support organizations work this way? It can be one of two answers, or both. The first, they don’t have sufficient compensation based on their performance. The second, they don’t have the knowledge to care about who they’re talking to. The first problem you’ll have to solve on your own. The second, call recording will help solve. In a true sales situation, where the difference between a sale and nothing is the salespersons level of skill, it’s vitally important the salesperson builds rapport. And in customer service, rapport is the difference between a customer who raves about your service on social media, and one who complains. Rapport establishes a solid foundation on which to do business. So how is rapport really built? Is it built by furiously listening for any window into the prospect’s personal life, then jumping on it? …and doing whatever it takes to serve their needs. People are drawn to others they sense CARE about them. And they know who truly cares for them, by how that person communicates with them. If someone you care about comes to you in grief, how do you respond? You subconsciously identify their state, and MATCH IT. Because you care enough to want to know what’s going on with them. You meet them at their level, and communicate on their level. The key to a revenue rocketing sales and support team is meeting the prospect at their level. Caring enough to put in the time to assess who you’re talking to and meet them at their level. When a loved one comes to you with grief, one of the reasons why you can match them so well is because you know who they are. You know them when they’re happy and when they’re sad. So when something is wrong, you know it immediately. With a brand-new over-the-phone prospect, it’s a different story. But, it is possible to very quickly understand who you’re dealing with. Using the four personality models I’m about to unveil, you can instantly get a read on who the person is, and what type of communication style they most likely prefer, using only the sound of their voice. You can then match them on this level immediately and use the feedback you get from their response to calibrate. This is a very nuanced topic, and it’s only possible with call recording. When you can listen to a call multiple times, you can make a very clear and accurate read on them. You will very quickly pick out the four personality types through the recordings. You can then train your sales and support staff through these same recordings until they can also instantly identify the personality type they’re talking to. When your entire sales and support staff meets the customer at their level, and then communicates, sales and customer satisfaction levels soar. You might think it’s easier to pick up on someone’s personality in person. Although that can be true, it most often isn’t. It can be more difficult to step outside of ourselves and become the observer during in-person communication. But in order to accurately assess who we’re talking to, becoming the observer is crucially important. Otherwise, you’re too involved in the interaction and too self-conscious of your own behaviors to pick up on another’s. It’s different over the phone. There’s already some distance between you and the caller. And, you’re strangers. This makes it considerably easier to be the observer. So what are we observing? As you’ll see as I describe the four personality types, first and foremost, we’re listening closely. We’re listening to how the caller speaks. Their vocal tonality. Once we get a grasp on their tonality, which we can do almost instantaneously, we can get an idea of their personality type. Once we know their personality type, we can begin to meet them at their level, which will form the base of the conversation moving forward. Now, it’s important to clarify one thing. These personality types are accurate more often than not. But they are NOT 100% accurate, and no personality type system will ever be 100% accurate. All humans are different. And there are outliers and exceptions to every rule. So it’s vitally important that you form an idea of who the caller possibly could be, and then continue to test that assumption throughout the call. If it turns out your initial assumption is right, continue forward. If it turns out it was wrong, re-calibrate until you get a match. As the color implies, the red personality type is the bold leader. The action-taker. The entrepreneur and star salesman. Almost all red’s have a fast, monotone style of speaking. They don’t like wasting time, and want to get directly to the point. So, they make their words short, direct, and quick. They’re very in control of themselves and usually quite disciplined, which is reflected in their monotone voice. Reds also use sarcasm for humor, so be prepared for this so it doesn’t catch you off guard. When you identify a red (through their tonality), immediately match them on their level. Shorten your sentences. Speak quickly and with little inflection. Get to the point. Reds are driven by achievement and being challenged. So if possible, emphasize these qualities and associate them with your product or service. Don’t be intimidated by reds, and if necessary, challenge what they’re saying. Many reds know exactly what they want out of a call. If you sense this is the case, provide it for them quickly and efficiently. And if possible, give them the possibility to achieve something (a discount or other bonus) if they try for it (but don’t give in too easily). The gold personality type is nearly opposite of the red. You will know a gold personality type by their slow, moderate, melodious voice tonality. Their voice will fluctuate often, and will be very driven by their emotional state. Golds are the supporters and diplomats. They often avoid confrontation, and can be scared away by it. When you identify a gold, match the moderate pace of their speaking, and inject your own emotions into your voice. Be open and trusting with them, and they will reward you for it. When selling products or services, emphasize their inclusion into the team or company. When handling a gold over to support, thank them for being a part of your organization. If a gold calls in with a problem and is frustrated or flustered, comfort them as much as possible, calm them down, and solve the problem in a very clear, positive manner. In general, golds are lighthearted and kind, and appreciated being treated as such in return. Green personality types are the puzzle and problem solvers. They are incredibly logical, organized and measured. You will know a green immediately, by their moderate, careful monotone speech. If a green is in a good humored mood, expect cerebral, meta-level jokes. They will often come to the call armed with information, statistics, and their formidable logic. If a problem arises, they often take the position that if they were in charge, the problem would’ve never happened in the first place. Greens have logical opinions about everything, and are usually correct. Often times in a call, they’ll have already thought about everything you might say and have a response for it. Be unfazed by this, and continue forward at a moderate, logical pace. Match a green by slowing down, and bringing logic into play. Back up everything you say. Make no lofty declarations or abstract references. Keep it simple and straightforward. If you’re ever unsure of something during the conversation, it can be valuable to ask for the green’s input. Be careful with this though. If you ask a green for help on something they think you should clearly be the expert in, they will be severely unimpressed. The blue personality type is energetic, enthusiastic, and generally upbeat. You’ll know a blue immediately, by their quick, melodious style of speech. They’ll talk fast, and make slapstick style jokes. If they’re in a good mood, they’ll likely laugh often throughout your conversation. Match them by not taking yourself too seriously and letting yourself get a little “loose”. Blues love to have fun and they love getting the approval of others. Let your guard down and have fun with the call. But never lose sight of the end goal. Blues love to inspire, so let their upbeat positive energy catch on to you. Let them know that you’ve appreciated the call with them and they will be incredibly grateful. 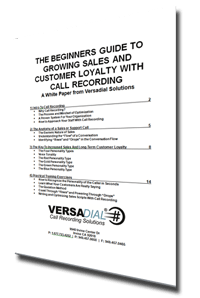 This excerpt is Part 3 of 4 from The Beginners Guide to Growing Sales and Customer Loyalty with Call Recording (White Paper). Please stay tuned next week for part 4 (Final).